The Telugu Desam pulled its ministers out of the Modi ministry last week. 'Therefore, the special category status to this residual state was imminent and necessary for its development,' YSR Congress MP V Vijayasai Reddy explained in the Rajya Sabha. Sir, the Presidential address does not mention the grant of special category status to the residuary state of Andhra Pradesh and I would like to explain the facts. The then honourable prime minister of this country on 20th February 2014 had assured on the floor of this august House that the special category status would be granted. Though it is not incorporated in the Andhra Pradesh Reorganisation Act, it is an assurance that has been given by the then honourable prime minister which has not been adhered to. 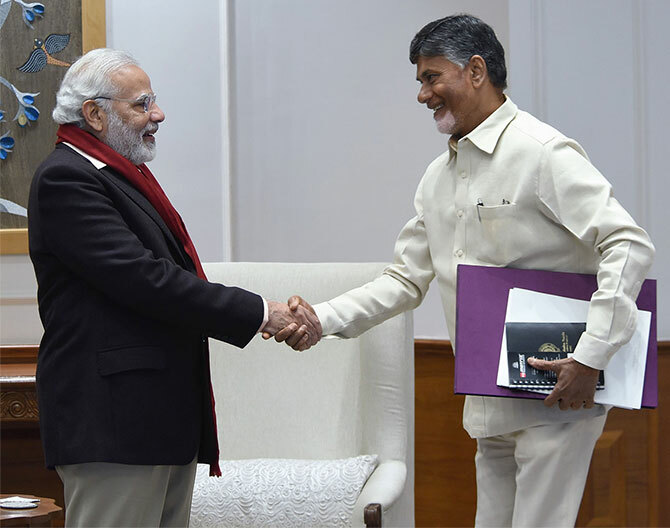 The second point is the Union Cabinet on 3rd March 2014 had taken a decision to grant the special category status to the residuary state of Andhra Pradesh and decided that the matter be referred to the then existing Planning Commission. Sir, whether the matter had to be referred to the Planning Commission or not, it was the prerogative of the government. It was not mandatory. Sir, in fact, the Bharatiya Janata Party, which is ruling now, had included this in their manifesto in 2014 and it is part of their manifesto. Sir, why are we clamouring for special category status? It is not merely for the sake of asking 'special category status' that we are asking it. Sir, when the state was divided, when the Congress party had decided unilaterally and damaged the interest of the people of Andhra Pradesh, it was the decision taken then, and in the light of the fact that the capital of Hyderabad was going to Telangana. Sir, Hyderabad, which was the capital of composite Andhra Pradesh, had the film industry there, had the software industry there, had the majority of the public sector undertakings; and the software industry had an annual turnover of approximately Rs 80,000 crores. All these institutions have gone to Telangana and the residual part of Andhra Pradesh has been left as an agrarian state. Therefore, the special category status to this residual state of Andhra Pradesh was imminent and necessary for the development of Andhra Pradesh, in order to have development of the state of Andhra Pradesh on par with the neighbouring states and other states of this country. Sir, the honourable finance minister, while making a reply on this issue, has pointed out several times that the 14th Finance Commission has prohibited granting of special category status to any of the states after the Planning Commission was abolished. This is the reply that he had given, but that is not so. I have gone through the 14th Finance Commission Report and, to the best of my knowledge, nowhere has the report stated that special category status should not be given to any state. In fact, they have no jurisdiction in this matter. They have not dealt with this matter at all. Further, I would like to point out in this august House that the Finance Commission's recommendations can only be recommendatory in nature and those cannot be binding on the government. Sir, coming to the second issue, it has been categorically stated in Schedule XIII of the Andhra Pradesh Reorganisation Act that a separate railway zone, with Visakhapatnam as its headquarters, would be granted and would be constituted. Sir, four years have gone. What happened to the provisions? Is it not the responsibility of the government to implement the provisions of the Act? Sir, similarly, it has been categorically stated that a steel plant would be set up in Cuddapah district of Andhra Pradesh. It has not been implemented. In the same Schedule, it has further been stated that a sea port would be constructed at Durgarajapatnam, close to Chennai, on the Andhra Pradesh-Tamil Nadu border. Similarly, it has been stipulated in the Act that a petro-chemical complex would be constructed in Visakhapatnam. There is nothing. Four years are over. Then, there is the Vizag-Chennai Industrial Corridor that has been promised in the Act, and it has not been implemented so far. Sir, apart from this, the last item, which is also very important, is that the Act also provided that a metro rail project would be considered and constructed, both at Visakhapatnam as well as on the Vijaywada-Guntur-Tenali route. What happened to that? Sir, if the provisions of a particular Act are not implemented, where should we go? Whom should we ask? SubSection(iv), Section 90 of the Andhra Pradesh Reorganisation Act is very clear that the Polavaram dam would be implemented by the central government and also the cost would be borne by the central government. In fact, subsequently, there was a proposal that post-2014 increase in the prices should be absorbed by the state. This was the proposal that was mooted. Of course, it is not tenable and, as per the Act, it is the responsibility of the central government to complete the Polavaram Project, whatever the project cost. Whether it is pre-2014 prices or post-2014 prices, it does not make any difference. Sir, in the same Andhra Pradesh Reorganisation Act, it has been categorically stated that seven districts in Andhra Pradesh have been identified as backward districts -- Vishakhapatnam, Vizianagaram and Srikakulam and, on this Rayalaseema side, Cuddapah, Kurnool, Chittoor and Anantapur. For these seven backward districts, a package has been announced and the package would be similar to that of the Bundelkhand special package in Uttar Pradesh and Madhya Pradesh and that of Koraput-Bolangir-Kalahandi. This is the package which has been stipulated in the Act. Sir, let me be very frank in saying that the honourable members of the Congress party while participating in the Motion of Thanks for the Presidential address have referred to the interference by the government in the working of the investigating agencies like the CBI, ED and Income Tax. I have no hesitation in saying that it is the Congress party which has nurtured and established a very bad precedent of interfering in the working of these investigating agencies. I fondly hope that the successive governments would not follow the bad precedent which has been set up. Edited excerpts from the speech by V Vijayasai Reddy, YSR Congress Party MP, in the Rajya Sabha, February 6, 2018.